The Alliance of Women Film Journalists* has just announced their picks for the best in 2015 feature films. 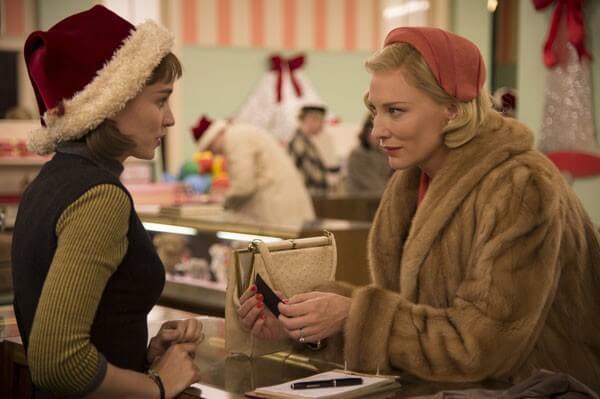 Carol starring Cate Blanchett and Rooney Mara led all of the nominees for the 2015 EDA Awards with nine nominations, with Mad Max: Fury Road earning six. Spotlight and Room tied with five each followed by The Martian with four nominations. Winners of the Alliance of Women Film Journalists EDA Awards will be announced on January 12, 2016. Chantal Ackerman – In Memoriam For being a great filmmaker and sinpiration. Maria Geise – Activist filmmaker who is spearheading the movement for parity for women directors. Donna Langley – Chair(wo)man, Universal Pictures, who has brought the studio to unprecedented profits. Jennifer Lawrence – For breaking the silence about discriminatory practices and unequal pay for actresses. Charlotte Rampling – Because she’s Charlotte Rampling and is iconic. * – I am a member of the Alliance of Women Film Journalists.